Maturity And The Meaning Of Curiosity : 13.7: Cosmos And Culture The Curiosity rover on Mars shows that, perhaps, we are ready to solve our problems. It shows us that we can face impossible challenges and find real, lasting solutions. This artist concept shows NASA's Curiosity rover as it will look once it starts investigating the Martian surface for the ability to sustain microbial life — past or present. Our world seems so broken now and so much of it seems our own fault. The whole of our infrastructure — from highways to high schools, power-grids to public universities — seem on the verge of crumbling. The resources to repair or expand these arteries of public life are gone, we are told, in part because four years ago the economy was jerked to halt through (what appear to be) selective acts of titanic greed and apocalyptic mismanagement. So we turn to our political structures to solve these great issues, only to find they are frozen. Serious debate and discourse have become impossible and, it seems, only the loudest, most intransigent, most divisive voices are given the stage. Meanwhile, the respiration of the planet — its pathways of atmosphere, hydrosphere and biosphere — have all shifted, an unintended consequence of our own culture building. The climate is changing. Yet we can't even begin a serious conversation about that reality. We face radical new challenges that demand a new kind of national maturity. Our response suggests that we've come down with a national contagion of puerile incompetence. And then along comes Curiosity. By now everyone has seen the insane set of maneuvers required to get a ton of mobile robot laboratory onto the surface of Mars. The "7 Minutes of Terror" video went viral precisely because it showed just how hard, how impossible, this problem was to solve. "Rocket powered 'skycrane'? Yeah, that's gonna work"
But it did work. 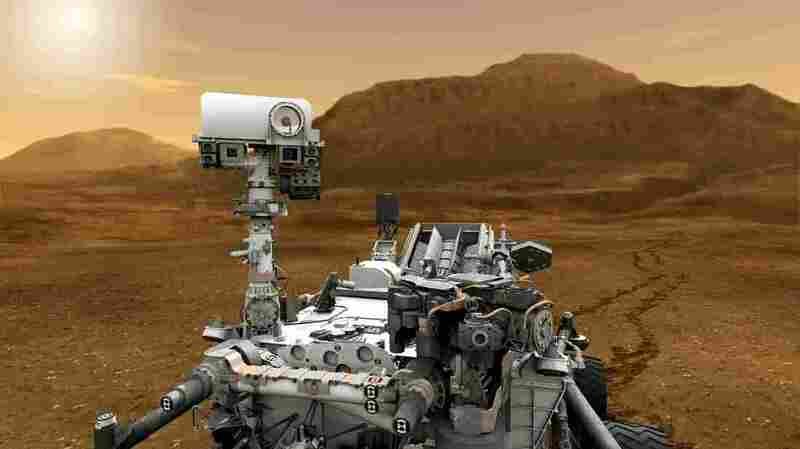 The nearly 10,000 men and women working on the Mars Science Laboratory applied their best efforts, their most serious efforts and they solved their problem. They stepped up to the plate, worked together night and day and made it happen. And who were these people? Where did they come from? Curiosity could never have built, could never have flown and could never have completed its daring touchdown onto the floor of Gale Crater without the overlapping efforts of government, universities and private industry. Some of these folks probably voted Republican in the last election and some voted Democrat. Some go to church each week and rely on the power of faith. Some don't understand what faith means. None of that matters. They worked together and solved an impossible and unsolvable problem. Now that the fruit of their efforts is shaking the Martian dust off its chassis and prepping for its real mission (searching for signs of ancient life), we can step back and understand Curiosity's real meaning for us as Americans and as citizens of the only (known) habitable world in this solar system. We can solve problems. We can solve really big, really scary and really impossible problems. We can do amazing things. But we can only do these things when, collectively, we step up and take on the mantle of adulthood. We can only do these amazing things when we set aside the childish pleasures of fits and tantrums and rise to the level of responsibility that maturity demands. The challenges we face — from climate change to resource depletion — have appeared just now because we are at a turning point in our evolution. You don't alter you planet's atmospheric chemistry unless you have reached a certain level of, let's say, "ability". But to paraphrase Spiderman's uncle, abilities come with responsibility and responsibility demands maturity. As a species, we are called to new kinds of behaviors never before seen in the entire history of our evolution. Curiosity shows that, perhaps, we are ready. It shows us that we can face impossible challenges and find real, successful solutions. We can do anything if we are creative, if we are responsible in our collaborations, if we step up to the demands of our families, our communities, our nation and our planet as adults. You can keep up with more of what Adam Frank is thinking on Facebook and on Twitter @AdamFrank4. His latest book is About Time: Cosmology and Culture at the Twilight of the Big Bang. This post originally described Curiosity as having solar panels. The vehicle's power is, in fact, nuclear, coming from a "radioisotope thermoelectric generator."